So you’ve been turned off by church. 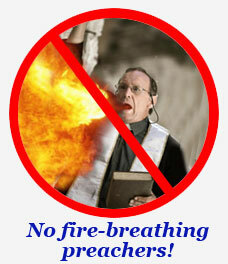 Perhaps you’re tired of fire-breathing pastors and threats of Hell. Perhaps you’ve actually been wounded by the church, either through congregational conflict,condemnation, or by someone’s active misbehavior. Whatever the case, there’s usually a reason why people have left a particular congregation or left church altogether. Perhaps, like many, you see the church as simply irrelevant. We can’t fix the hellfire-and-brimstone preachers out there or the folks who claim to be Christian but behave in hate-filled ways. But we can tell you that the Moravian tradition has always been one of peaceful, faithful living and emphasis on the words and actions of Jesus. We don’t preach divisive doctrines and threaten eternal damnation. We believe that it is hard to argue with kindness and decency. Moravians emphasize faithful living that reflects the love of Jesus rather than doctrines and disputes. We believe in living faith in community, and so we find great relevance to being in relationship with other people of faith. If the church seems irrelevant to you, you may not have experienced what church is really about: shared lives of faithfulness, mutual support, spiritual growth and discussion together. We can’t promise you that Trinity Moravian Church will be an instant answer to what has turned you off to church in the past. But we can promise that you’ll find something different than you have experienced before, and you’ll find a level of acceptance here that just might change your perspective. 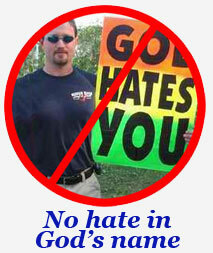 It’s sort of sad to have to define ourselves as not being a hateful, negative church. But sad as it is, we know it’s necessary. We seek to follow Jesus and share His love and grace, and must differentiate ourselves from those who preach fear and hate claiming to do so in the name of Jesus. We don’t think that’s what He wanted at all.